In an era of increasing commercial innovation in space, many big-name companies are taking to the skies to explore how microgravity research might enhance their products. 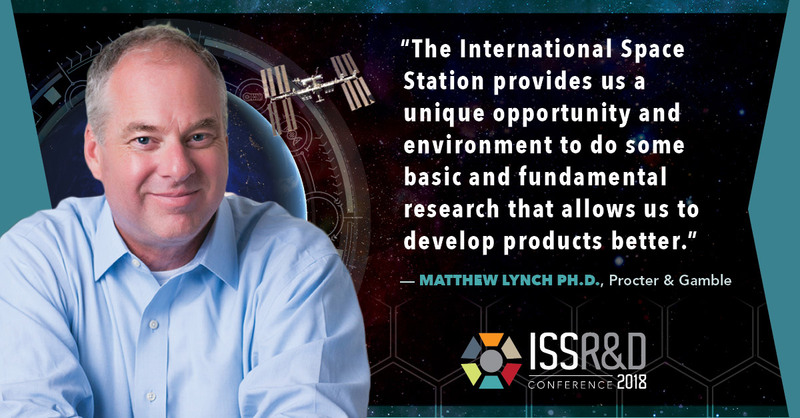 But for Procter & Gamble (P&G), a giant among household product providers, spaceflight has been a part of their R&D portfolio for almost a decade—and recently, they have shared exciting progress from their ISS experiments investigating the new science of polydisperse systems. A common problem in the consumer product world is how to develop new and clever ways of suspending materials in fluids. Consumer foams and gels—such as the familiar products from Gain®, Dawn®, Tide®, Olay®, Gillette®, Pantene®, and many other P&G brands—depend on the stability of such mixtures. This is particularly true for polydisperse mixtures; that is, liquids or gels that contain particles of different sizes in suspension. Unfortunately, how these mixtures move and break down is often not fully understood, which poses a challenge to product designers and manufacturers: How to create better, longer-lasting products that maintain all their desired features. For example, shampoos contain oils that give the product nice characteristics for a consumer; for example, the oils condition hair and make it easier to brush. But oil droplets suspended in a liquid tend to separate over time, because the oil tends to float to the top. So how does a manufacturer keep these droplets suspended in solution without changing the product so much that it loses its functional and preferable characteristics? One way to keep droplets suspended is to introduce tiny sticky particulates into a mixture. These micro- and nano-sized particles stick together to create strands that form a net structure within a fluid, stabilizing the movement and dispersity of larger droplets in the mixture. The behavior and effectiveness of such “nets” is the focus of P&G research on the ISS, led by P&G Principal Scientist Matthew Lynch. For nets to stabilize a complex mixture, they have to possess mechanical strength. 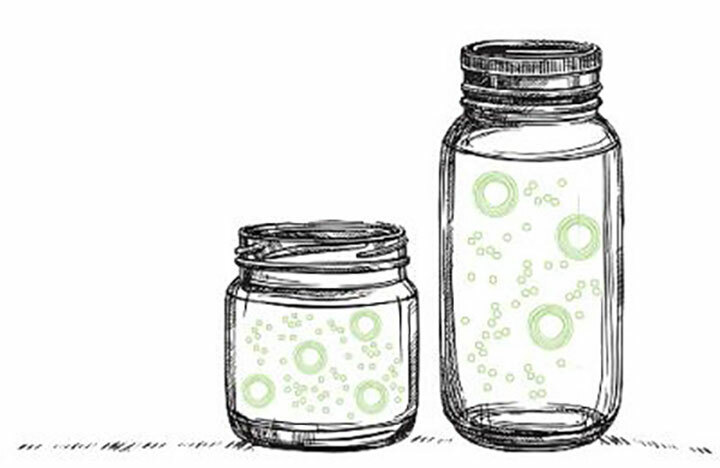 The net must “catch” larger droplets responsible for product benefits (such as oils), keeping the droplets from separating out of solution. But the net also has to be flexible—it must stretch and even break so the mixture can flow like the commercial foams and gels a consumer is used to. For example, the fluid mixture that makes up a shampoo must flow like a liquid when a consumer squeezes it out of the bottle. However, while the shampoo sits in the bottle, both the manufacturer and the consumer ideally want the solution to behave almost like a solid—keeping the droplets of active materials in place, dispersed throughout the bottle. An ideal product thus acts like a solid as it sits on a shelf in the store or in your home—or even as it is transported down a bumpy road—but under the influence of mechanical force (such as squeezing the bottle), the product flows like liquid. Basic (rather than applied) science works to answer these fundamental questions and build a foundation for new technologies and new ideas. Lynch’s team works on “upstream R&D” at P&G, performing investigations in such basic sciences—and eventually improving mathematical models to describe the underlying phenomena responsible for the behavior of fluid mixtures. Technically termed complex fluid physics, the basic science P&G is performing onboard the ISS is the study of colloids, or mixtures of particles dispersed in fluids. On the ISS, the complexity of the mixtures in the P&G experiments is somewhat balanced by the simplified elegance of fluid physics in microgravity. Changes in product behavior happen more slowly in microgravity because of reduced buoyancy-driven fluid movement. Moreover, there are fewer confounding factors to studying these systems on the ISS (for example, sedimentation, which is gravity driven). The ISS has thus allowed P&G to isolate and study the interactions within complex systems under time scales not possible on Earth. Specifically, Lynch’s team has been investigating how the nets within fluids keep droplets dispersed and maintain a product’s functional characteristics. The ultimate commercial application of this science is something every consumer can appreciate—shelf life, which is dependent on how long these nets stay intact. “Imagine you have a strand of sticky particles that hold all this stress,” said Lynch, “but there’s a characteristic time scale for how this strand will change and break down over time.” As the many strands within a product break down, the product’s structure will eventually collapse, and the various components of the mixture will separate. The product then becomes unusable. Companies currently have some understanding of the probability of strand breakdown within nets over time, and they use this to predict shelf life. But current models for how this occurs are one-size-fits-all, best describing only simple systems with sticky particles of uniform dimensions. True product chemistry involves polydispersity—interacting particles of many sizes. Breakdown within polydisperse mixtures is complex and difficult to model or predict, let alone to exploit for design of better product formulations. In other words, current models can give companies indications of how product breakdown will occur, but in the real world, mixtures are not simple, static systems—they are dynamic and complex. 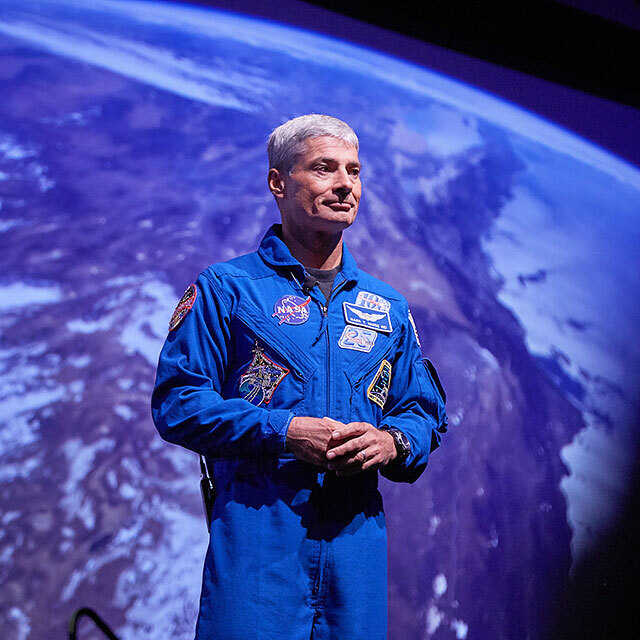 Therefore, pragmatic approaches to not only predict shelf life but also improve product design must be driven by a better understanding of the underlying fundamental physics—and the ISS is ideal for this kind of investigation. 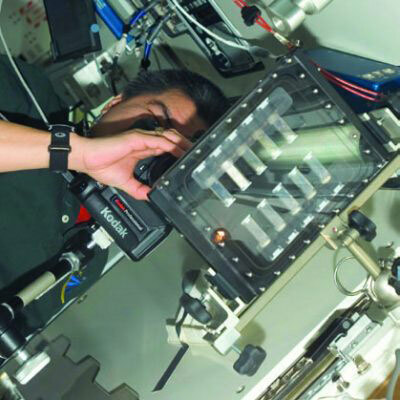 For P&G, the robust history of colloid physics investigations onboard the ISS also paved the way for a streamlined, effective R&D experience in space. In collaboration with NASA, CASIS, Harvard, Case Western Research, and service provider ZIN Technologies, Inc., two series of P&G experiments were conducted over the past decade, with complementary goals and results building a new knowledge base for understanding polydispersity. 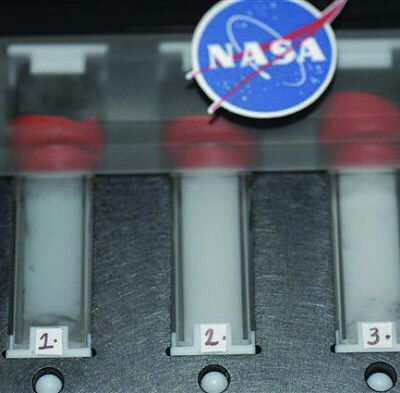 The experiments—one series through NASA sponsorship and the other through CASIS and the ISS National Lab—involved the study of complex fluids at both ends of the spectrum: microscopic and macroscopic. 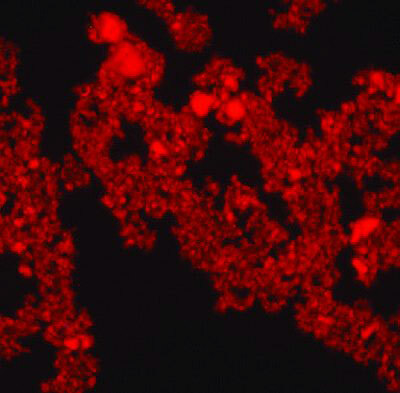 In the NASA-sponsored experiments (part of the Advanced Colloids Experiment, or ACE, series on the ISS), P&G studied colloid dispersions—the fundamental physics of how suspended particles move and evolve over time within a fluid. The systems studied not only varied particle size but also differing levels of particle stickiness—which can also be controlled as part of product design. Basic science knowledge about how these varied mixtures and particles behave will allow manufacturers to predict characteristics, including shelf life, of commercial products that depend on this physics and chemistry. In contrast, the CASIS-sponsored experiments (part of the Binary Colloidal Alloy Test, or BCAT, series) looked not at microstructure but rather at the ensemble, over longer time scales. Functionally, this allowed P&G to assess the “aging” of a mixture at a very detailed level, because the separation of mixtures occurs more slowly and evenly within spaceflight samples than on Earth. The parallel approach of P&G’s multiple investigations, correlating the microscopic data from ACE with the macroscopic phenomena from BCAT, has allowed the company to see evolving “textures” at the product level that correlate with microscopic events. In this way, the ISS is providing a robust, repeatable platform for P&G to diagnose observable behavior of consumer products on Earth. Ultimately, the P&G experiments seek to improve product chemistry—tying the spaceflight investigations back into tangible benefit to consumers on the ground. And the story continues, as future P&G experiments are already scheduled to launch later this year and take advantage of upgraded ISS hardware. If a company creates sticky particles of the same size and introduces them into a mixture, the particles organize themselves into strands. These individual strands interact to form the net structure product chemistry seeks to exploit. But the behavior of sticky particles of varying sizes—the attractive interactions of polydisperse systems—is not well understood. It is these more complex systems that may hold the key to better products with enhanced features and longer shelf life. Polydisperse mixtures behave very differently than the more well-defined systems with uniform particle size.